itâ€™s our understanding that weâ€™ve reached an agreement and have scheduled the repairs to your transitions for this week. Please contact us if you have any additional questions or concerns at 888-588-2315 x4195 or customersupport@empiretoday.com. Several years ago we had Empire Today install laminate flooring in our home. The initial installation went well and the flooring looked great. Over the course of time, several "transition" pieces between the laminate flooring and other flooring areas have cracked/chipped. 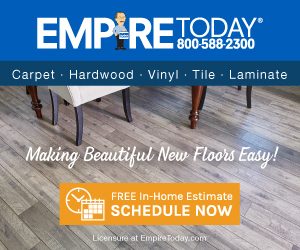 We were sold a "lifetime" warranty on the flooring, but Empire Today now states that only the "main laminate flooring" is covered in the warranty, not transition pieces, molding, and the like. Very disappointed and absolutely will not use nor recommend Empire Today ever again. If they won't stand by their product then I will go elsewhere. Review #306681 is a subjective opinion of KeithSiegfried.